Simon has enjoyed a successful career in exporting working in the private sector. He has in depth knowledge of a wide range of markets from Europe and the USA, to the Middle East and South East Asia. He worked for many years in the international division of a Belgian multinational. Simon set up SGB Associates (UK) Ltd, 10 years ago to provide specific export training workshops, overseas business consultancy, and international marketing development to businesses and organisations exporting, partnering or looking to expand into overseas markets. SGB Associates have provided this service for UK Trade & Investment since 2004. In this time Simon has worked with more than 500 companies discussing the company’s strategy, assessing the appropriate “route to market” options and supporting their developments. During this period Simon has co-written a range of guides for UKTI on subjects including Overseas Joint Ventures, Successful Licensing, Selling Services Overseas Guide and International Trade – An Accountant’s Guide. and negotiation of a wide range of documentation. During his career he has lived for some 12 years overseas, mainly in the Gulf, and during that time handled a lot of work involving agents and distributors. He was a partner with a City law firm in London from 1989, when he returned to England after eight years in the UAE, until May 2002 when he established his own legal consultancy – www.gilesdixon.com. He is also founder of ContractStore – www.contractstore.com – an online business which has some 250 contract templates that can be bought and downloaded online. The catalogue includes contracts for appointing agents and distributors as well as other documents designed for cross-border business. As well as this book, Giles is a contributing author to Schmitthoff’s Law & Practice of Export Trade published by Sweet & Maxwell and of Business Terms & Conditions e-kit, published by Lawpack in conjunction with ContractStore. with African and other third world government with in the next month. We are going to help build roads out of dirt in 15 African countries. Thanks for your message Kenneth. It sounds interesting. 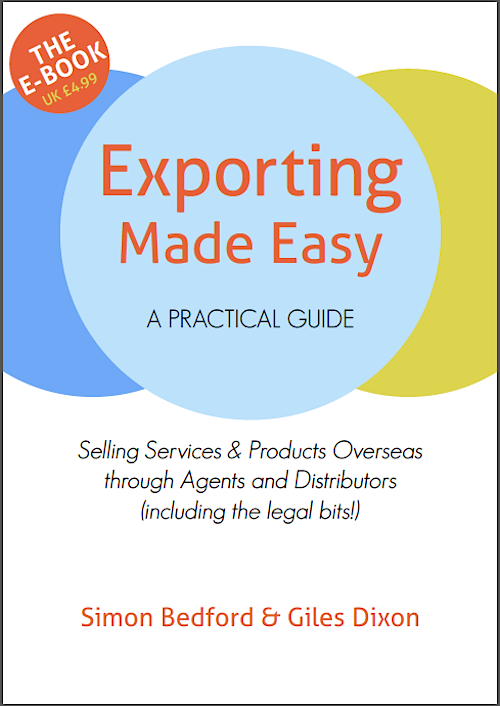 We don’t deal directly with specific projects but if you want some guidance we can recommend the Open to Export website or of course, to download our own Exporting Made Easy ebook. You could alternatively order a print copy or browse the articles here which might give you some useful pointers.